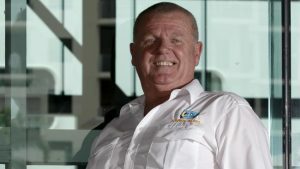 Cairns glazier Barry Wilson has been named Australia’s first ‘Master Glazier’, by the Australian Glass and Glazing Association (AGGA). This is a major milestone for Barry, owner of Cairns Glass and Glazing, who has been honing his craft, skills and trade for over 40 years. Commencing his glazing career as a 16-year-old, working at his uncle’s business Whitsunday Glass, Barry gained experience across the country, before starting Cairns Glass and Glazing in 1992. “My main forte I suppose, is that I excel in all areas of the glass and glazing industry, not just in one or two areas,” Barry said. The ‘Master Glazier’ certification is the highest level of attainment available through AGGA and is great news for the ongoing development of the glass industry. agga-master-glazierIt provides glaziers with a pathway for advancement and acknowledges a new level of professionalism within the industry. Additionally, it ensures customers can have confidence in the glaziers that have this accreditation. Barry Wilson started as a glazier in 1974. In 1993, he obtained his Certificate III accreditation and in 2016, he became the first in Australia to receive ‘Master Glazier’ accreditation. “To have that ‘Master Glazier’ status against your name is quite rewarding, it’s humbling really,” he said. Barry is the benchmark in innovation and installation, with significant depth of knowledge across a wide field of glazing specialties. Barry and his team at Cairns Glass and Glazing offer more than 170 years combined experience. They offer a comprehensive range of commercial and domestic glass and glazing services and are available 24 hours a day, 7 days a week to respond to your glass emergencies. For more information, contact Cairns Glass and Glazing on (07) 4035 6122.